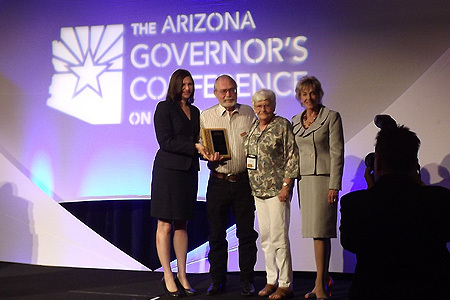 On Thursday June 11th, 2013, the Run to the Pines Car Show won the 2013 Governor’s Tourism Award for Special Events. The Special Events Award is presented to the event that best embodies the word special, meaning it creates a unique draw for tourism and attracts visitors from outside the local area. The winning event stands out because of its creative approach, distinctive appeal, media coverage and/or enhancement of community pride, thus contributing to the state’s quality of life. Past winners include; Bisbee 1000, the Great Stair Climb, Superstition Harley-Davidson Lost Dutchman State Park Observation Run, Arizona’s Gift from the Grand Canyon State, the U.S. Capital Christmas Tree, and Gold Rush Days in Wickenburg. Special thanks to Debe Campbell, group sales for Pinetop-Lakeside; Buck Biddle, submarine veteran and the Man About Town; Beverly Stepp, former director of the Pinetop-Lakeside Chamber of Commerce; Sherri Beardsley, vice president of the A.P.P.L..E Corp and volunteer for Run to the Pines Car Show; and Barbara Bruce. Questions? Click to contact the Run to the Pines Car Show, Inc., using the Run to the Pines Car Show Contact Us form. ©2019 Run to the Pines Car Show, Inc., and respective photographers. | All rights reserved. | Website built by Spider Trainers.